Our map shirt gets its name from the large concealed chest pocket designed to hold the funny papers, aka topographic maps. Please note that it is not necessary to bring a map of the Sahara on any of the major Pacific islands. As usual, we did not ask the US Army for permission to borrow the design of its M1953 utility shirt (M stands for model, P for pattern). The M1953 was originally issued to the US Marine Corps in the mid 1950’s. Early models were cut from OD herringbone twill, to be replaced in 1956 by a sage green cotton sateen version… The M1953 is the basic pattern of our Map Shirt. Since our map shirt is no replica, we figured we’d give that “Gomer Pile” pattern a few MF® twists. It is available in three different fabrics for Fall 2014, and the first to be released is a camouflage version. Italians are not only famous for having invented entertaining football in 2006, but also for coming up with the “telo mimetico” in 1929. That original ‘simulating fabric’ is known to be the first printed camouflage to be issued to troops. It came in the form of a half-shelter tent. This revolutionary concept beat any previous attempts from the French to hand paint foliage concealment on issued gear. Little did the Italians know that camouflage would eventually be put to better use decades later, making it to Pitti Uomo, living rooms and closets. 1) It fell off the Buzz Rickson’s truck and we know Sgt. Bilko. 2) Because of an inspiring photo found in the book “Les Papous Coupeurs de Têtes“ (Tony Saulnier, 1961), based on the Oscar-winning film “Le Ciel et la Boue“, a documentary we mentioned when introducing the “Sea Hunt” watchman jacket. 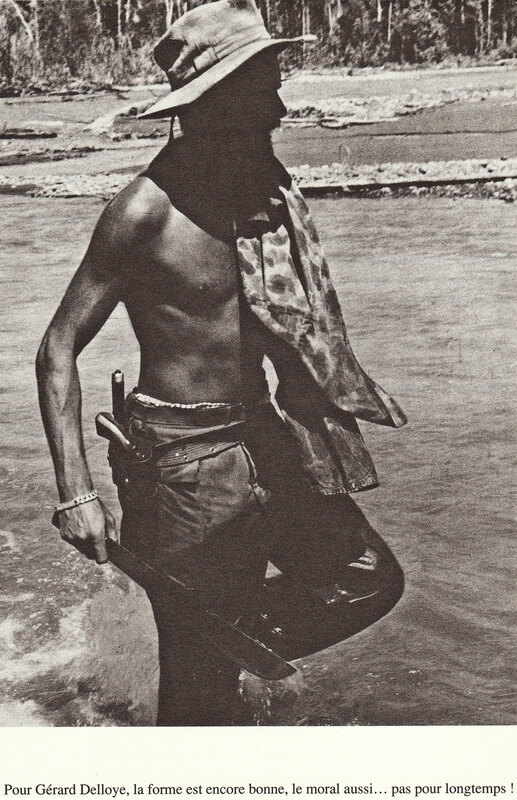 In an epic capture, one of the member of that 1959 expedition, a shirtless Gérard “machete” Delloye is seen wading through a New Guinea river carrying a military surplus USMC-issued frog skin jacket. With its origins in the early days of WW2, the P1942 frog skin camouflage fabric is considered to be the first printed camouflage issued to American Armed Forces. It is well documented that early tests for tropical warfare fatigues have been conducted around 1940, but most scholars still dispute the fact that field studies have involved Martha Vickers. We have R&D documents. Tasked with providing US Marine Raiders with proper concealment in Pacific islands jungles, the US Army Corps of Engineers came up with a reversible fabric around 1942, printed with a green-dominant jungle side and brown-dominant beach side. It eventually proved to be less efficient than hoped for by General McArthur’s fighting troops, and was mostly abandoned by the end of 1944, when its similarity with some Wehrmacht units camouflage attracted friendly fire in Normandy, France. Surprisingly, the 100% cotton base fabric is originally… white. Yes! After the HBT textile is milled, it is printed on each side with two different patterns, involving several screens and a total of five different colors. This double-sided printing process was a type of complicated silkscreen/roller set-up with partial bleed-through effect, and quite the novelty in the early 40’s. To clarify, our Map Shirt is not reversible. However, the fashion-forward will know to suavely roll the sleeves and display the ‘beach’ side at any given moment, triggering instant admiration and generating envy from peers. We have added a touch of blue with concealed cotton chambray accents, for no other reason that we found the combo visually pleasing. If this shirt can be worn tucked-in, as the original M1953 shirts were intended to, we have added side slits to compliment an un-tucked look. Anyone reading this is old enough to not be told how to wear their shirt anyways. Inspired my 1950’s UMSC-issued utility shirts. 100% cotton Herringbone Twill (HBT), P1942 “frog skin” camouflage, double sided printing. Fabric milled in Japan for Buzz Rickson’s. The “Sea Hunt” Map Shirt is designed in California by Mister Freedom® and manufactured in Japan in collaboration with Sugar Cane Co.
* Two chest pockets, concealed button flaps. * One large map inside pocket, side opening. * One concealed chest pocket, top opening. * Concealed button-hole tape placket. * Light brown corozo buttons. * OD 100% cotton thread stitching. This garment comes raw/unwashed and will shrink to tagged size after an original cold soak/line dry. Further shrinkage to be expected with the use of hot water and heat dryer. It is intended to be a comfortable fitting shirt, easy to wear over a chambray shirt or Tshirt. If you are a Medium in mfsc jackets/shirts, you are a Medium in the Map Shirt. Because the base HBT fabric is white before being printed, toning down of colors will naturally occur. This fading should not be considered a quest or a defect, only the natural consequence of the wash/wear process over the years. Please refer to sizing chart for raw/rinsed measurements.